Sen. Bernie Sanders (I-Vt.) participates in a FOX News Town Hall in Bethlehem, Pennsylvania, Monday. 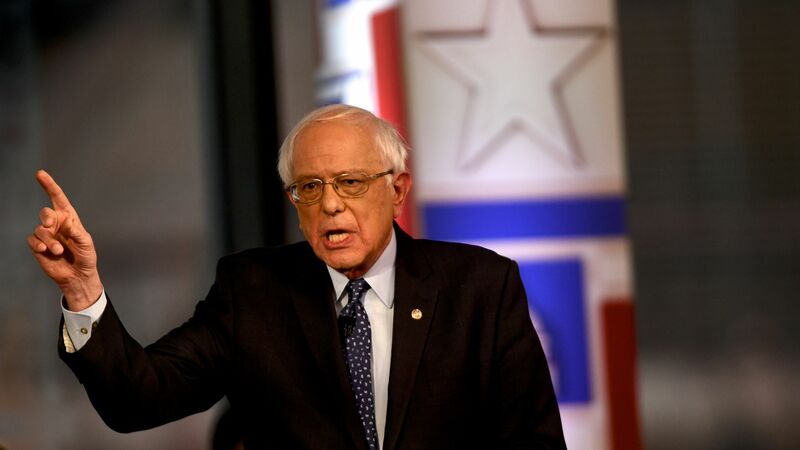 Democratic 2020 frontrunner Bernie Sanders defended being a millionaire, called for immigration reform, criticized President Trump and won applause for his "Medicare for All" plan at a Fox News town hall Monday. Details: Moderator Bret Baier asked the Vermont senator if the 180 million people on private insurance would lose it under Sanders' proposal. Sanders said millions of Americans lost health insurance every year, perhaps because their employer changed insurers, whereas his plan would provide stability, prompting cheers from the crowd. The big picture: Sanders' town hall in Bethlehem, Pennsylvania, was at times a fiery affair, as he covered his stance on a variety of issues in discussions with Fox News’ Baier and Martha MacCallum during the hour-long program. On democratic socialism, Sanders said the concept is about "creating a government and an economy and a society for all," instead of just the top 1 percent. On Sanders' tax returns, which he released before the town hall that showed he's now a millionaire, he defended his status. He credited a recent book for his new wealth and said he wouldn't apologize for that. "Isn’t that the definition of capitalism and the American dream?" Baier asked. Sanders disagreed and said he wanted a country where everybody has opportunity. "I paid the taxes that I owe. Why don’t you get Donald Trump up here and ask him how much he pays in taxes?" On Rep. Ilhan Omar (D-Minn.), who's been accused of using stereotypes often perceived as anti-Semitic when criticizing Israel, the Jewish senator defended the freshman. "It is not anti-Semitic to be critical of a right-wing government in Israel," he said. He said she might need to do a better job in speaking to the Jewish community. On immigration, Sanders said there needed to be sensible, comprehensive reform. "We don't need to demonize immigrants," he said. On the Southern border, the senator said he would enlist "many, many more judges to expedite the process." On Trump, Sanders called the president a "pathological liar." However, he said Democrats would lose the 2020 election if they devoted all their time to attacking Trump. On Yemen, Sanders appealed directly to Trump on his favorite network to end U.S. support for the Saudi Arabia-led war. On Sanders' age, MacCallum asked the 77-year-old what he would tell voters who believe he’s too old to be president. "Follow me around the campaign trail," he said.